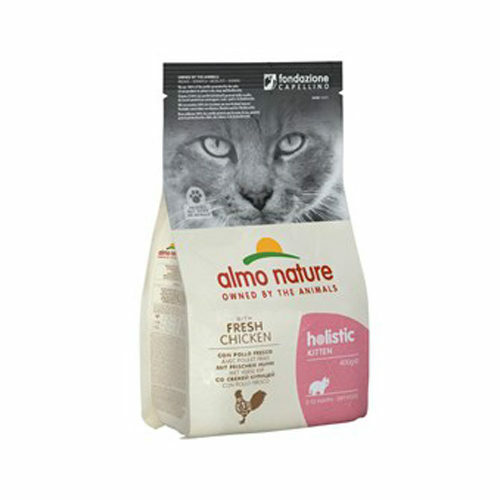 Almo Nature Cat Holistic Kitten is dry food for kittens made from natural ingredients. This dry food with chicken and rice contains a high percentage of meat and ingredients that are important for your kitten's development. Almo Nature Cat Holistic Kitten is dry food for kittens made from natural ingredients. This dry food with chicken and rice contains a high percentage of meat and ingredients that are important for your kitten's development. Suitable for kittens aged from 3 or 4 weeks to 10-12 months. All of the ingredients in this food are natural. The chicken is free range (no hormones or antibiotics have been used during the rearing process). The chicken has also been specially selected for quality, so the meat is rich in natural vitamins and minerals. Almo Nature never uses chemical preservatives, colouring agents and/or other chemical additives and is always preserved naturally. This makes Holistic Kitten Food a conscientious and healthy choice for your kitten. Holistic kibble for kittens is available in a 400 gram, 2kg or 12kg bag. Have you used Almo Nature - Cat - Holistic Kitten before? Let us know what you think about this product.